Grace owns a venerable worship space in Brooklyn Heights. 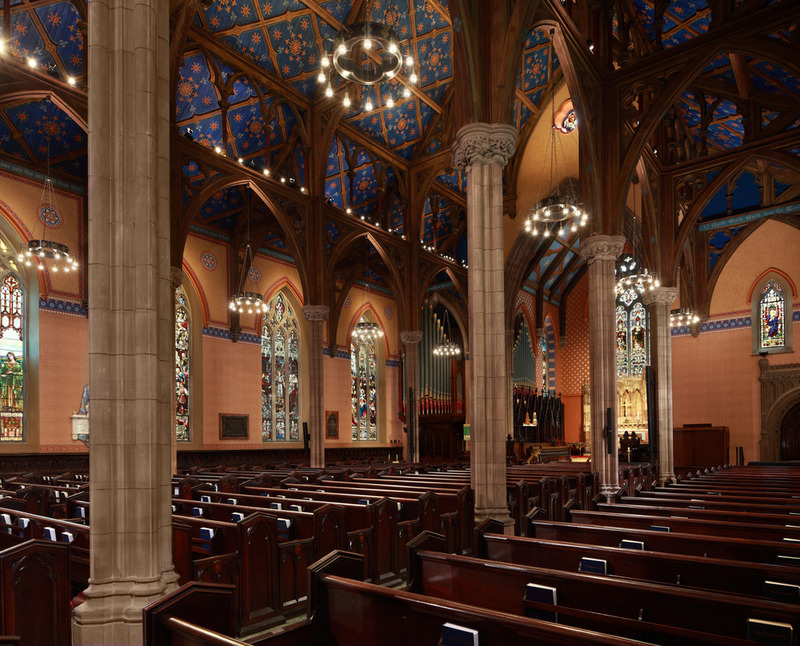 The brownstone gothic church, designed by Richard Upjohn and erected in 1851, features a high truss-supported nave and art-glass windows. Leaders of its active congregation asked Leo J. Blackman (now BLuHR) Architects to undertake a master plan. We considered best use of parish offices and other non-worship space, clarified entry to the church and adjoining school complex, and proposed improvements to the nave. These included water-proofing and thermal insulation, upgraded lighting, power and HVAC, acoustic fixes, and restored interior finishes. After prioritizing our findings, the building committee asked us to proceed with carrying out the master plan. Our team included CTA Architects & Evergreene Architectural Arts. A condensed 9-month schedule had interior and exterior renovation work occurring simultaneously under LPC scrutiny. 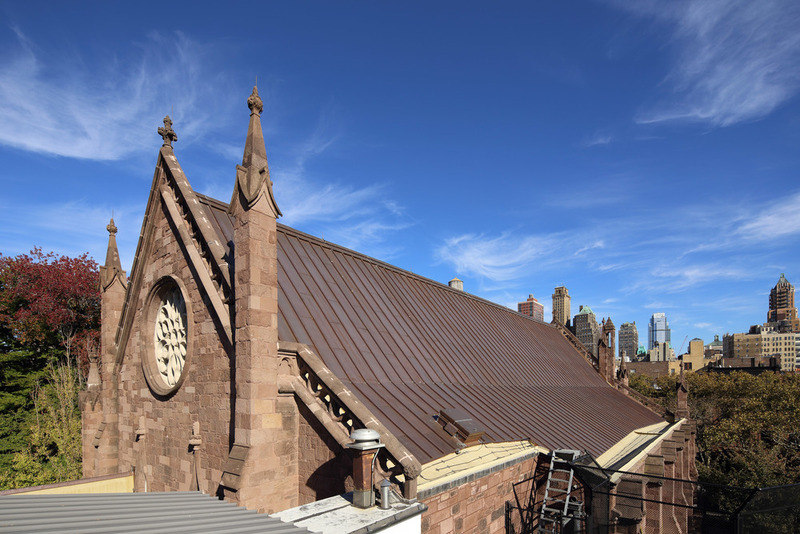 Outside, a brand new copper-batten roof replaced deteriorating asphalt shingles, while brown- stone tracery copings were removed and reinstalled on new flashing. Inside, new wiring and light fixtures were installed: custom chandeliers and concealed LED uplights. These lamps reveal a spectacular decorative polychrome paint scheme from the 1870s — a brilliant stencil-patterned ceiling which had been covered for 100 years. As promised, Phase I was completed for Easter 2014. This project was honored with the NY Landmarks Conservancy’s 2015 Lucy Moses Award. Click drawings below to enlarge.